On Mar. 18, 1945, in the final game of the 1944-45 season, Maurice ‘Rocket’ Richard of the Montreal Canadiens becomes the first player in NHL history to score 50 goals in one season. In honor of that NHL record-setting accomplishment (one of many for The Rocket) we have pulled this great piece from the THW Archives. Written by former THW contributor Mike Moore and originally published on Jan. 9, 2011. The Rocket did it first. 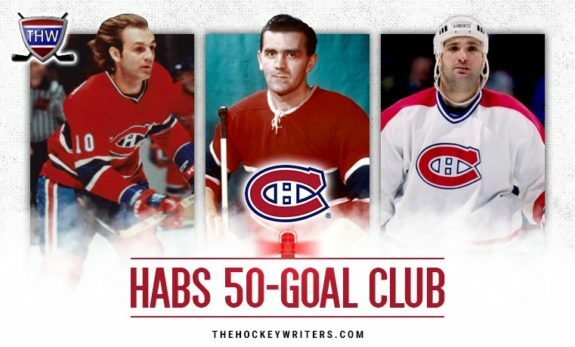 I don’t believe in astrology, so pardon me when I borrow the expression, “all the stars were aligned” in 1944-45 when Maurice Richard became the NHL’s first 50-goal scorer. The achievement was monumental at the time and the circumstances under which it was accomplished will never be replicated. The legend of Maurice Richard gets bigger with time, as does the story of the first 50-goal season. With so many players serving in the military, the NHL had debated shutting the league down entirely but continued to operate throughout World War II at the urging of both the U.S and Canadian governments and in the interest of public morale. As always, most NHL players of the day came from Canada, a country divided over the conscription issue. But it’s too easy to shrug off the significance of the Rocket’s feat by claiming the rosters of NHL teams were ravaged by wartime commitments. All teams scrambled to ice the very best players they could find during World War II, and some teams fared better than others. It was a watered-down league in 1944-45, but not completely without star players, representing all teams, that excelled during and after the war years. As it turned out, the Montreal Canadiens were able to retain the services of the best three scoring forwards in the league. Two of them were of English-Canadian descent, one of French-Canadian descent. 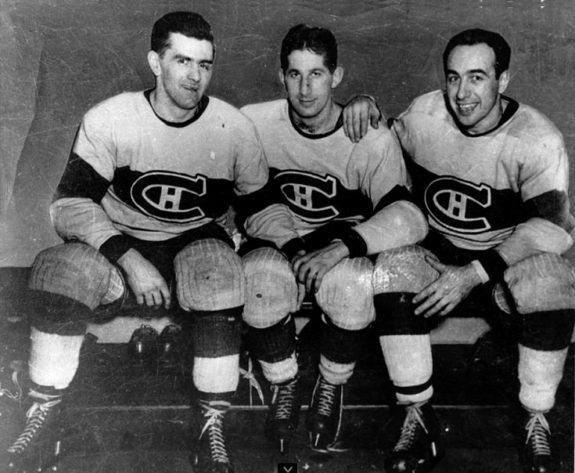 The “Punch Line” comprised of Elmer Lach, Toe Blake and Maurice Richard finished the season 1-2-3 in the scoring race. It would be remiss to highlight Maurice Richard’s record-breaking, 50-goal season of 1944-45 without pointing out one particular NHL rule change that had come into effect the previous season with the desired result. Once again, the NHL had been striving to inject more offense and speed up the NHL product. The center-ice red line was introduced and now forward passes were allowed across the blueline and up to center ice. Goals per game spiked to an average of over 4 for the first time in decades. It took several seasons before team defenses adjusted, but before they did, the Rocket ruled. exactly 50 games. Hockey wasn’t the first thing on everyone’s mind, but it provided a nice diversion, especially when an emerging superstar was showing signs of accomplishing something great. After the first 19 games of the ’44-45 campaign, the Rocket had scored 19 goals. A week later, he exploded for 5 goals and 3 assists in a 9-1 pasting of the Detroit Red Wings. Close to the end of February, the Rocket had accumulated 44 goals tying Joe Malone’s all-time, single-season record established in the NHL’s inaugural season of 1917-18. On February 25th, the Habs hosted the Leafs and Richard couldn’t think of a better team against which to set the record. With less than three minutes left to play, the Rocket hit 45 and Montreal Forum fans went berserk. For eleven non-stop minutes, the delirious crowd applauded their hero. Joe Malone was on hand to present Richard with the record-setting puck at game end. For years after, Maurice Richard remembered goal # 45 as his highpoint of the ’44-45 season. Next objective – 50 in 50. The Rocket needed five goals in eight games. It was well within reach. By the 2nd to last game of the season, Richard had notched 49. The Habs faced the Chicago Blackhawks in their last home game. The fans sensed number 50 was imminent. During the game, Richard was granted a penalty shot. Much to the chagrin of the Forum crowd, he was stopped, both on the penalty shot and all evening long by seldom-used wartime replacement goalie Doug Stevenson. One last chance remained on March 18, 1945 in the season’s finale, Game 50 in Boston. The Bruins went into the 3rd period with the lead and had kept the Rocket off the score sheet so far. Finally, at 17:45 of the 3rd period, Elmer Lach led the Canadiens’ rush that resulted in a knock-in rebound for Richard. 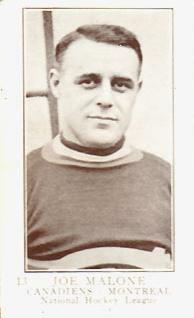 Harvey Bennett was the Bruins’ goalkeeper. The entire team left the bench and mobbed him. He had scored goal number 50 in 50 games with just over two minutes left in the season. The Canadiens won the game 4-2. On that night, the Rocket set the standard by which all future goal-scoring greats would be measured. Hockey is a team sport. When something great is accomplished by an individual, there are usually other members of the surrounding cast that contribute and achieve greatness simultaneously. In 1990-91, Brett Hull set a St. Louis Blues team record when he scored 86 goals. It’s no coincidence that in the same season, Adam Oates set the Blues’ team record for assists with 90. These two complimented each other handsomely and reached new and loftier heights together. 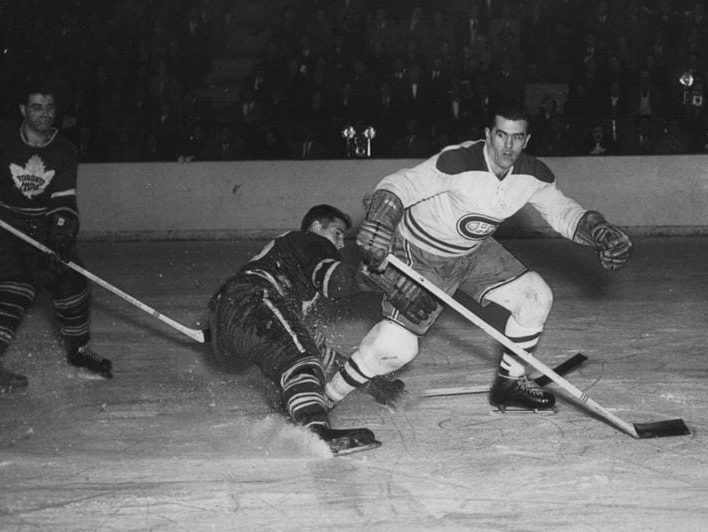 In 1944-45, Maurice Richard’s linemate and centreman, Elmer Lach also set a new NHL record with 54 assists. It was Lach who actually won the scoring title as well as the Hart trophy as the NHL’s MVP. Along with Toe Blake on left wing, the trio of Lach-Blake-Richard was an awesome force. Nobody else during Maurice Richard’s career through 1960 scored 50 goals in one season again, even though the regular season schedule was bumped to 70 games by 1949. It became easy for skeptics to dismiss his 50-goal season of 1944-45 as a wartime fluke. Not even the Rocket scored 50 again. But he did come close. By 1946-47, all NHL rosters had been re-filled by returning war veterans. In fact, five of the six starting goalies of that season were future Hall-of-Famers. In 1946-47, Richard scored 45 goals. The difference? In February of 1947, Elmer Lach fractured his skull and was lost for the remainder of the season. Could a healthy Elmer Lach have ensured for another 50-goal season by the Rocket? Absolutely. Gordie Howe never had a 50-goal season. He came close as well. During the 1952-53 season, Howe potted 49. The schedule maker helped make sure the Rocket’s record was safe for one more year. Howe’s Red Wings faced the Canadiens in the final game of the regular season and the Habs threw a defensive tarp over him. No way was Gordie Howe going to be allowed to equal Richard’s record. The game concluded in a 1-1 tie. Howe was kept scoreless. 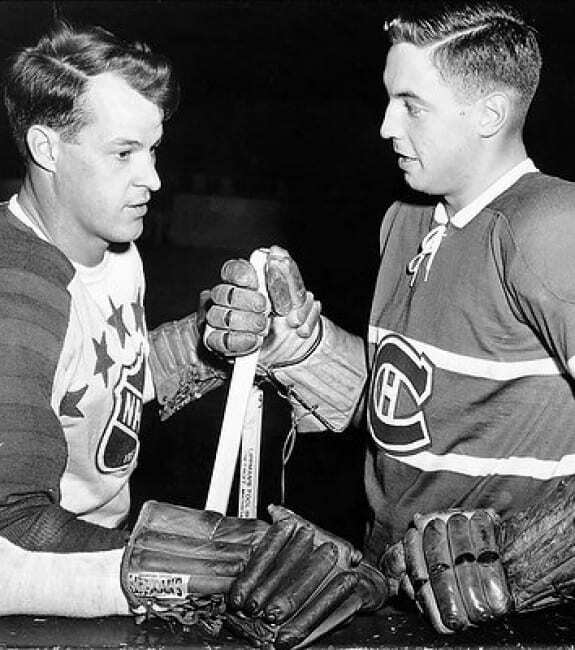 Finally, in 1961, a full 16 years after Maurice Richard had set the bar, Bernie “Boom Boom” Geoffrion of the Canadiens became hockey’s 2nd 50-goal scorer. It took him 64 games to tie the record that the Rocket had set in just 50 games. Bobby Hull became the first player to score more than 50 goals in a single season when he potted 54 in 1965-66. He was also the first to record multiple 50-goal seasons, doing it five times in the NHL. By 1973, all of the Original Six teams except the Toronto Maple Leafs had a 50-goal scorer of their own. But no one had equaled the Rocket’s mark of 50 goals in 50 games. In 1981, one of the game’s all-time greatest snipers became just the 2nd ever to accomplish the deed. 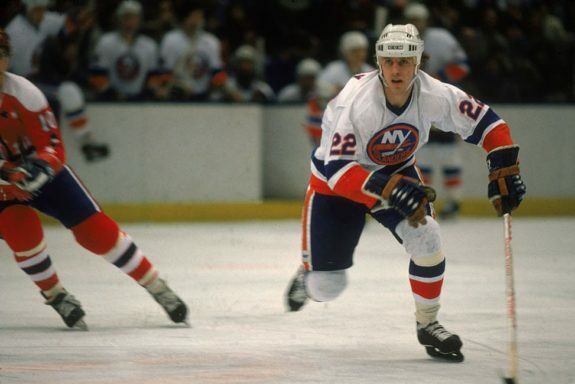 Mike Bossy scored 50 goals in the Islanders’ first 50 games of the 1980-81 schedule. Once again, it seemed like a tremendous achievement until the following season when Wayne Gretzky made a mockery of it all by bagging 50 goals in his team’s first 39 games. Outrageous! As of 2010, the 50-goal season has been achieved 188 times. Gretzky and Bossy have done it nine times apiece. Still, only five players have scored 50 goals in their team’s first 50 scheduled games in a season; Richard, Gretzky, Bossy, Lemieux and Brett Hull. These five guys have combined to do it eight times. It’s not outrageously improbable that a player score his 50th goal of a season on his birthday, unless he was born between May and November. But what are the odds against the same player doing it three times? Phil Esposito bagged five 50-goal seasons in his Hall-of-Fame career. In three of the five, he treated himself to a birthday present and scored number 50 on February 20th, his birthday. Of course Wayne Gretzky, who accomplished just about everything, also scored his 50th on his birthday one time. Goaltender Dennis Herron holds the dubious distinction of allowing a 50th goal six times. Guy Lafleur accounted for three of those six. The first rookie to score 50 goals was Mike Bossy in 1977-78. Only one player has ever scored his 50th on a penalty shot – Mario Lemieux, April 11, 1997. Only two teenagers have scored 50 goals in a season, Wayne Gretzky and Jimmy Carson. The Pittsburgh Penguins have produced eight different 50-goal scorers, more than any other team. A record 14 players scored 50 or more goals in 1992-93. Mike Bullard has been the only player to score 50 goals with a last place team. He scored 51 for the 1983-84 Penguins. The oldest player to score 50 was Johnny Bucyk in 1971. He was 35. The first non-Canadian born player to hit 50 was Ken Hodge in 1974. Hodge was born in Birmingham, England. The last player to score 50 goals and not wear a helmet was Al Secord for Chicago in 1983. Federer on Wawrinka: "He's a Fighter and a Winner"